What a great game on October 12! 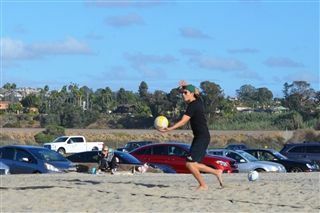 The Boys Beach Volleyball team matched powerhouse San Marcos High School play for play. It couldn’t have been closer in score with four of the five pairings going to three sets. Coach Barb Corbeil reports "San Marcos ended up on top 3-2 but it was strong performance both mentally and physically for Pacific Ridge!"